Some varieties of persimmon fruits are astringent and taste dry due to their high levels of tannins. There are also types of persimmons that are non-astringent and have a sweeter taste and can be eaten before they are fully ripe and still firm. Most people enjoy eating persimmons raw, but you can also use them in cooking or in baked foods. In this article, you will learn why persimmon fruits are so good for you. You will also find out what scientific research backs up many of the health benefits of persimmons. Persimmons are also called Sharon fruits or hurma fruit. The most common astringent variety of persimmon is the Hachiya fruit and the non-astringent sweet type is the Fuyu fruit. What Does a Persimmon Fruit Look and Taste Like? Persimmon is an orange fruit that looks like a tomato and has a tough skin. You can eat the skin of a persimmon as it will help you meet your daily fiber needs. One of the most popular varieties of persimmon is the Japanese persimmon, or, Diospyros kaki fruit. Most varieties of the Japanese persimmon contain high levels of tannins that reduce as they mature. This is why eating an unripe persimmon makes your mouth feel dry and with astringent taste. However, when ripe, this is a sweet-tasting fruit that has soft flesh. Hachiya is the astringent variety of persimmon that has a dry taste if you eat the fruit before it is ripe. Fuyu persimmons (fuyu fruits) are sweet non-astringent persimmon fruits and can be eaten with the skin even before they fully ripen. One of the reasons why persimmons are a popular fruit is that they are very nutritious and good for you. As with many fruits, persimmons contain sugar. A standard persimmon contains 21 g of sugar, most of which is glucose and fructose. All varieties of persimmon contain trace amounts of calcium, magnesium, copper, potassium, phosphorus, and iron. One of the unique health benefits of eating persimmons is that they are a storehouse of antioxidants. Research has shown that phytochemicals in persimmons have a protective effect against a number of ailments. If you want to enjoy the health benefits of persimmons, then you should make sure and choose ripe, sweet varieties that have a juicy flesh. In general, Fuyu persimmons are non-astringent sweet sub-tropical fruits and have a vibrant orange color. Usually, sweet persimmons look like a tomato with a flat base. Some types of persimmon such as Sharon fruit are astringent when growing but taste sweet when fully ripe. Some people say that eating Hachiya persimmons before they are ripe will leave your mouth with astringent and dry taste due to the tannins in the fruit. Persimmons will continue to ripen after picking and will become soft. Some persimmon varieties are almost mushy when ripe, and eating them with the tough peel may be messy. To eat your ripe persimmon, you should cut off the leaf-like flower stem from the top of the fruit. Cut the fruit in half and remove the inner stem and seeds if they are present. You can eat the persimmon fruit along with the peel because the skin isn’t toxic. You can add persimmons to fruit salads, eat them raw, add to smoothies, or use in baking. Let’s look in more detail at scientific studies showing why persimmons are good for your heart, digestion, and health in general. The fact that persimmons are packed full of vitamins means that they are a great fruit to boost your immunity. Learn about some easy hacks to give your immune system an almost instant boost. You can also learn about other foods, vitamins and supplements to help prevent infections by boosting your immunity. 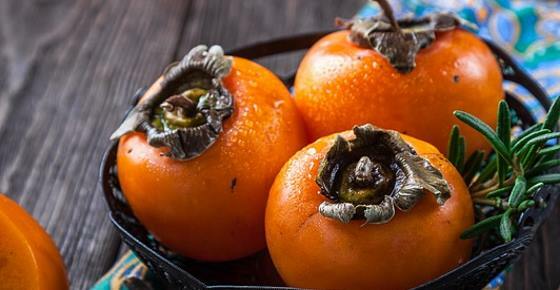 One of the many health benefits of Fuyu persimmons is that they contain antioxidants that are good for keeping your heart in good health. The benefits of persimmon fruits for your heart mean that you can include them in a cardiac diet. Let’s look at 2 specific ways why consuming persimmons boost your cardiovascular health. Compounds in persimmon flesh and peel are excellent for helping to manage hypertension. If you have high blood pressure, learn what you can do to treat hypertension naturally. Another reason why kaki fruits are good for your heart is that they help lower high cholesterol. Find out how to bring your cholesterol down naturally to safe levels. Fruits from the persimmon tree are great for helping to improve your digestive health. Due to their high fiber content, persimmons help you feel fuller for longer which may help to maintain a proper body weight. If you feel that your digestion isn’t working as it should, find out what else you can do to improve your digestive health. The high vitamin A content of persimmons (such as fuyu or hachiya persimmons) means that they can help to protect your vision from age-related eye diseases. Learn about other foods that are essential for good eyesight and can help prevent cataracts. You could also juice persimmons to help boost your vision. Regularly consuming persimmons and other anti-inflammatory foods can help to lower chronic inflammation. Why are persimmon fruits good for lowering inflammation? If you are dealing with chronic inflammation, it is important to know which foods are good for you and which are not. You could also add a few chunks of persimmon to make a delicious anti-inflammatory smoothie. Persimmon fruits are very healthy for you because they contain fiber, vitamins A and C, as well as a good amount of manganese. There are no known side effects from eating persimmons in reasonable food amounts.